Ronan Gorry. Picture: Alf Harvey. For many people the dream of living in the countryside is difficult to achieve as the reality of having to commute to the nearest urban centre for work means there is little time left to enjoy the benefits which attract them to rural living in the first place. One feasible solution is an increase in available and sustainable jobs away from urban hubs so employees won’t have to travel, and can enjoy more affordable housing and a better standard of living. And while four in 10 new jobs being created are in the Dublin region, progress is being made in spreading the growth more evenly throughout the nation. Over 60pc of the 18,846 new jobs created by Enterprise Ireland companies last year were outside of the Dublin area. And of the 22,785 jobs created by the IDA last year, over half were in regional locations. “We have exceeded our targets as 58pc of employment is now outside of Dublin, the highest number of people employed by IDA client companies in the history of the organisation,” says a spokesperson. But it’s not just government agencies that are making a difference. Rural business start-ups based on product innovation for the agri-food sector are also playing their part in reversing the drift towards the cities. A good example is Terra NutriTECH, a family-owned company in Kildare based on farm setting which allows local employees to combine the best of both worlds. Set up in 2012 in Moone, near Athy, by brothers Tom and Padraig Hennessy to meet a demand from farmers for an accurate means of dispensing minerals into water systems for livestock, the company launched slowly with older technology to establish market size and potential demand. So rapid was its growth, that the firm doubled year-on-year and was the overall winner of the National Enterprise Awards, followed by recognition as winners of the Google Adopt-a-Start-up programme 2018. Its success, according to Padraig Hennessy (pictured), is partly down to the fact that its location means people can enjoy a better quality of life. “Tom and I started this company out of our old family kitchen and slowly over the last five years we have grown the business to a point where we now have world-leading technology,” he says. “We moved the old kitchen table into our recently opened offices and it not only serves as our boardroom table but also reminds us of how it all began. “Having grown up in the community and built the factory and new office on our family farm, we are in the heart of a rural farming community. “There are over 10 members of staff from within a five-mile radius so this means many employees drop children off to school, or can coach their kids in sport as they have the time in the evening because they have virtually no commute or traffic — except the odd herd of cows around milking time! NutriTECH has 16 employees and expects this to increase to 40 jobs by 2021 as more products are launched. “In 2016 just after the Brexit vote we built our own manufacturing facility to produce the minerals to ensure continuity of supply in case of a (hard) border,” says Padraig Hennessy. “The following year we moved into developing our technology and launched new dispensing technology in late 2018. “This allows us to monitor water and mineral dispensing anywhere in the world from our base in Moone. “In Ireland our clients are progressive dairy and beef farmers, while abroad they are supplement companies. We hope to launch in up to 10 countries within the next 24 months. One man who is reaping the benefits is Ronan Gorry, a sales executive at the firm. 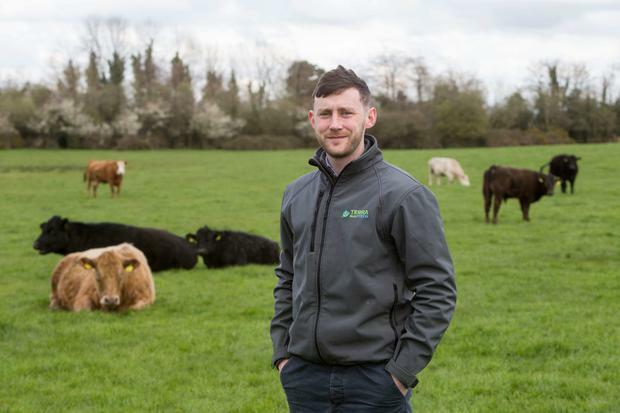 The job allows him to continue farming (suckler beef) in partnership with his father Pat in Kilcavan, Co Laois. “I used to work in Dublin and was only able to work on the farm on weekends,” he says. Since taking a job with NutriTECH a year ago, I am able to help out in the mornings and when I come home from work in the evenings. Keeping things local has certainly been of benefit for Terra NutriTECH, which has expansion plans both within Ireland and in the global market. And Padraig Hennessy says the future looks bright. “We are on The Pearse Lyons Accelerator Program run by Dogpatch labs and Alltech where 10 world leading Agtech start-ups are selected to help accelerate their business growth,” he says. “This culminates at Alltech’s conference in Kentucky in May, where Terra NutriTECH will be presenting to over 4,000 decision makers within the nutrition industry. “On the back of this we foresee our growth continuing and with that continued employment from the local community. Stephen Begley lives with his wife Sandra and their six children in Baltinglass, Co Wicklow. For 12 years he worked in a major company in Blanchardstown and endured a three-hour commute every day. Occasionally he was able to work from home, but most days he was out of the house for many hours, only getting to spend time with his family on weekends. But last year he joined NutriTECH and says the relocation to a rural company has been life-changing. “What is the point of having children if you don’t get to see them for five out of seven days a week?” he asks? “I was effectively a weekend dad and knew something had to give. I met the guys in the tiny office at the back of Tom’s house one evening and immediately knew this was something I wanted to be a part of. “I agreed to provide some advice and help them with some aspects of the technology to make sure they were getting what they were paying for, and it just grew from there. Now working as the chief technology officer for the rural ag-tech company, the father of six says his life has been transformed. “I have been in my current role for about eight months and love every minute of it,” he says. “We are currently going through a redesign of our system in readiness for the international release. It is such an exciting place to be and every day brings new challenges. “I now have breakfast with my children, drop the two eldest to school and arrive at work before 9am.